Conventional requirements as to social behavior proprieties of conduct as established in any class or community or for any occasion or a prescribed or accepted code of usage in matters of ceremony, as data court or in official or other formal observances. Fine dining etiquette is typically designed for a formal setting and the rules do not apply during casual meetings or social gatherings. A specific seat is allocated to every individual and food is served very precisely by waiters or servers. 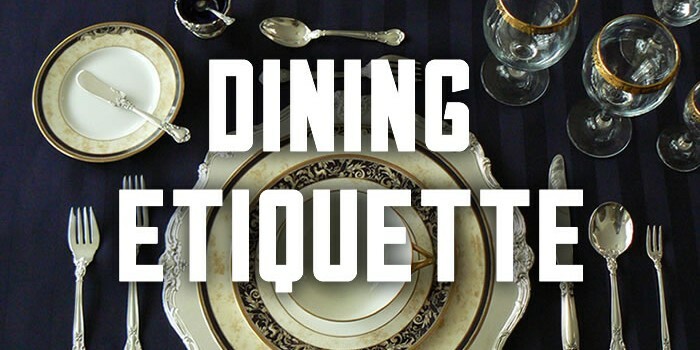 Fine dining etiquette can also be referred to as table manners. Corporate etiquette can be termed as a way of exhibiting socially acceptable behavior in business relationships. It can be defined as the way of behaving in a business environment. 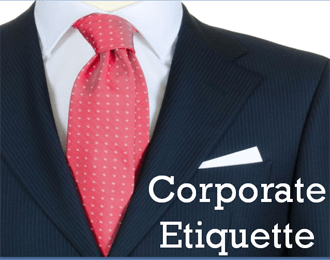 The importance of corporate etiquette is growing day by day. People are coming closer together due to the impact of advanced technology, which in turn increases the need for people relationship skills or good social manners. According to research conducted by the American Society of Quality Control, 68% of business is lost by corporates due to the indifferent attitude of employees while dealing with prospective clients. So, one can be assured of the significance of people skills in capturing the market share rather than the goods and services delivered. This proves the great need for employees to Invest or be train in etiquette to refine and sharpen the blunt edges of their people skills. Check your attitude for simple and common courtesies. Be sure you avoid annoying people around you by gossiping, raising your pitch, intruding on two people’s conversation, exhibiting fancy mobile ring tones loudly, etc, during a client meet or at your workstation. Treat others the way you wish to be treated. Be courteous and respectful towards your clients, boss, seniors, co-workers and subordinates. Never forget to thank or appreciate the person who helped you out. Make sure, while being respectful and cordial towards your co-workers and clients, to draw a distinctive line between your professional and personal life to avoid unnecessary complications. Your attire plays a significant role in enhancing your positive image. It adds spice to the talent, qualification and experience you possess and helps to gain self-confidence and success. So try to reflect your professionalism in your dress. At times in the work environment, you may come across some adverse situations. Be mature in dealing with unexpected situations as, sometimes, the way you react to a given problem will be more stressful than the problem itself. In today’s global business, one has to deal with multi-cultural people. So, before dealing with a prospective client or interacting with a co-worker, do a little bit of homework by researching the location they belong to or their preferences. This can help you respect their sensitive areas. Proper telephone etiquette is very important in that you are representing your department and the University. 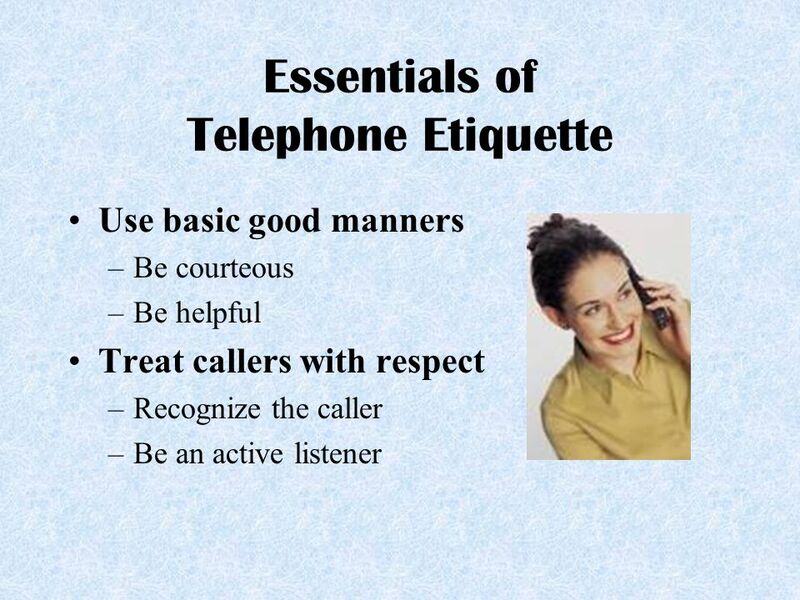 Remembering to use proper telephone etiquette, whether answering the phone or making phone calls, leaves callers with a favorable impression of you, your department, and Lehigh in general Use basic good manners. Be courteous. Be helpful. Treat callers with respect. Recognize the caller. Be an active listener. A picture paints a thousand words but the caller on the other end of the phone can only hear you. They cannot see your face or body language. Therefore, taking the time to speak clearly, slowly and in a cheerful, professional voice is very important. Use normal tone of voice when answering a call. If you have a tendency to speak loud or shout, avoid doing so on the telephone. Do not eat or drink while you are on telephone duty. Only eat or drink during your coffee break or lunch break. Respond clearly with “yes” or “no” when speaking. Never use swear words. Address the Caller Properly by his or her title. (i.e. Good morning Mr. Brown, Good afternoon Ms. Sanders). Never address an unfamiliar caller by his or her first name. Listen to the Caller and what they have to say. The ability to listen is a problem in general but it is very important to listen to what the caller has to say. It is always a good habit to repeat the information back to the client when you are taking a message. Verify that you have heard and transcribed the message accurately. Always ask if you can put the caller on hold. If you are responsible for answering multiple calls at once, always ask the caller politely if you may put them on hold. Remember that the caller could have already waited several minutes before getting connected to you and may not take lightly to being put on hold. Never leave the person on hold for more than a few seconds or they may become upset and hang up. Always focus on the call. Try not to get distracted by people around you. If someone tries to interrupt you while you are on a call, politely remind them that you are on a customer call and that you will be with them as soon as you are finished.